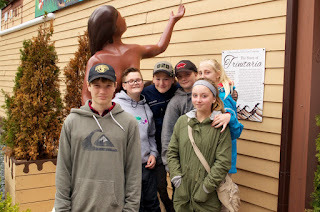 A few weeks ago the Grade Six class at Virginia Park Elementary participated in a school exchange program with the Hepworth Ontario Central Public School. It is now our turn to return the favor. On Saturday afternoon, 27 students plus guardians arrived to a community potluck at the Virginia Park Elementary Gymnasium. They were enthralled by Benni Malone and the Wonderbolt Circus , were screeched in (purity syrup, baloney and they kissed a Cod) and participated in some workshops before going to their billets for the night. The Whittle household has four guests for the week - Claire, Regan, Chris and Robert. 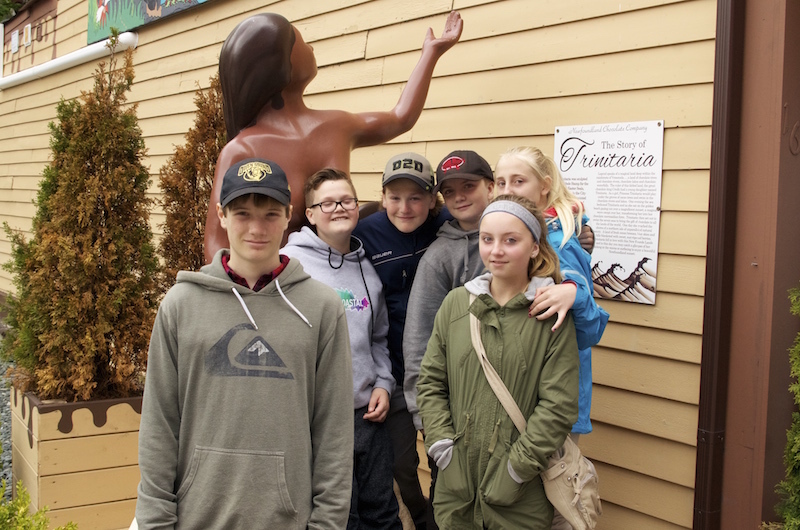 Principal Rodney Drover and Grade Six Teacher Ms. Bursey have put together a tight, fun-filled and educational six-day itinerary of cultural, ecological, geographic, historical, heritage, recreational and educational opportunities for them. 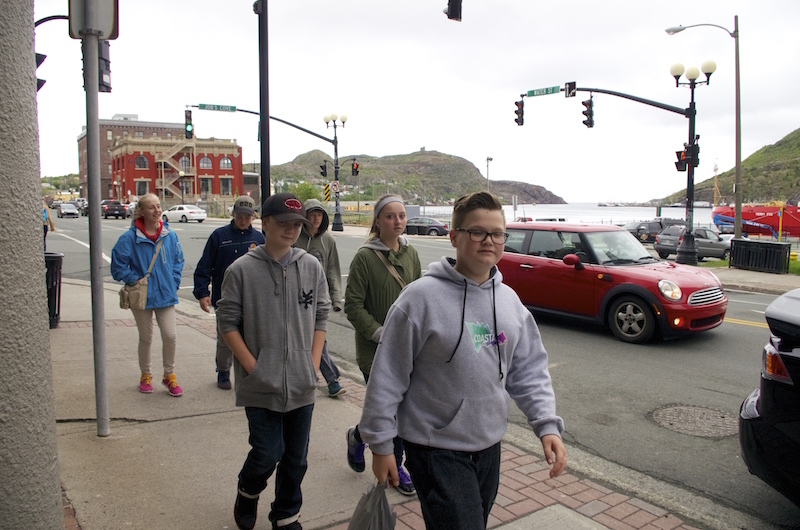 They will visit the Signal Hill Interpretation Center, The Geo Center, The Rooms, The Railway Museum, Brigus, Cupids, Salmonier Nature Park, Petty Harbour, The Basilica and even go on a trip oversees to Bell Island. In between they will participating in a number of hikes, walks and events - including a fire down at Middle Cove Beach. The cool temperatures and the RDF will not slow us down. Even though the Federal Government picked up the cost of transportation to and from the communities, I have been blown away by the costs associated with hosting for a week. There are food, admission and transportation costs. The later is the largest cost and good luck trying to find charity from bus operators. A trip out of town costs in excess of $450 each time! Than there is the cost of a couple of buses a day for outings in town. Insurances and safety mean parents can not be driving kids around - buses are the only option. We are a small school of 190 kids. Fundraising at the best of times is a challenge. While we hit our original budget target through ticket sales, 50-50s, donations from the School Council, the Virginia Park Community Center and a few businesses, we greatly underestimated our busing costs. For many of our kids, it was there first trip off the island. There eyes were open to the bigger world, opportunities and careers they had never considered before. This is an incredible cultural exchange but the challenges for small schools to be able to host is not small. 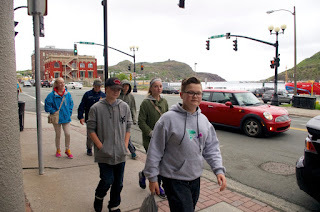 So, I am on the hook trying to raise another $1000 to ensure we give these kids a taste of Newfoundland hospitality that will last a life time. If you are interested in providing a small donation (or large) from a community group our business, we sure would appreciate it! We are also accepting in-kind donations for snacks and lunches! Come on - it is a good cause! They were here at The Rooms yesterday. Great group!